Is your RV Park Wi-Fi enabled? Does your Park provide the High Speed Wi-Fi Connection that RV'ers are expecting? 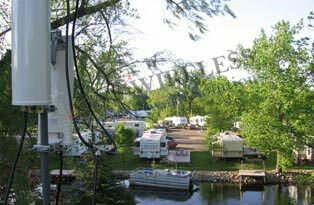 Does your Campground, RV Park, Marina, Resort or other outdoor area need extended range wireless network outdoors? More visitors are not only expecting great WiFi service, but actually requiring it where they stay. Extend the range of your wireless network with a fast ship, plug-n-play wireless hotspot solution that is ready to install out of the box. Or contact us directly for a custom solution. The density of mobile and IoT devices and video streaming websites/apps are increasing within RV Parks and Campgrounds. If your network is still running on 802.11b/g or 802.11N, then 802.11AC and 802.11AX access points are what should be considered going forward. In addition to the 4X improvement gains, backwards compatibility ensures that existing 802.11a/b/g/n clients will be supported. And you’ll be in position to support emerging 802.11ax (Wi-Fi 6) clients as they make their way onto your network. GNS Wireless will design, provide and support a high performance WiFi network using 802.11AC Wi-Fi Equipment, for your campground, RV Park, or Marina. 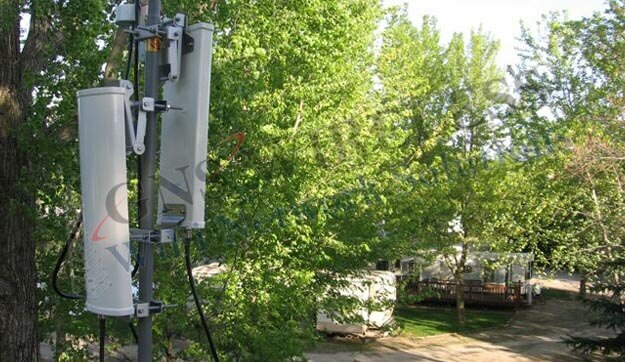 Utilizing state of the art antenna and radio technology, NEMA rated heated and/or cooled enclosures, we provide superior outdoor wireless range and bandwidth to meet the needs of your particular application. GNS Wireless also provides industrial grade wireless network solutions for warehouses, scrap yards, construction sites, and sporting venues. The underlying 2x2 MIMO, and 3x3 MIMO technology behind 802.11AC Wi-Fi improves range and coverage by increasing diversity at the device level – additional antennas and multiple streams of data. With automatic Channel selection architecture, GNS Wireless hotspot solutions add diversity at the system level – all APs (access points) operate on different channels, using the 5Ghz mesh backbone as the connectivity from point to point and this provides multiple opportunities to receive client transmissions. Combining the two approaches results in a powerful solution that delivers the best coverage of any enterprise WLAN solution for outdoor wireless hotspots. Conventional WLANs and residential wireless routers and wireless access points have trouble dealing with the unpredictable coverage patterns of outdoor 802.11n wireless networks , making it difficult to design a cellular WLAN with minimal cell overlap. GNS Wireless designs our outdoor wireless networks with overlapping coverage from adjacent APs, making the 802.11N and 802.11AC outdoor wireless network much simpler to deploy. Our approach also maximizes range, minimizes interference, and extends the wireless signal beyond the reach of typical wireless routers, and access points. GNS Wireless stocks a wide variety of access points, from top manufacturers that are available with either two or three radios that are able to support a mixed 802.11a/b/g/n environment enabling physical separation of very slow and fast devices, all from the same physical AP. The Teletronics EZplatform+, for example, delivers dual spatial streaming radios bringing 300Mbps air rate and 2x2 MIMO technology to the outdoor wireless network. GNS Wireless also stocks a wide variety of single radio access points to enable a single integrated deployment that supports all combinations of bands, modes, clients, and applications, without compromising performance. Most outdoor wireless networks will require multiple access points for maximum coverage. GNS Wireless offers plug-n-play, commercial grade wireless hotspot solutions for RV Parks, Campgrounds, Marinas, and other outdoor venues. We supply you with all the wireless networking equipment you need to provide a long range Wi-Fi signal at your indoor/outdoor location. We also provide configuration, design and installation services. We will assist in product recommendation, design layout, and include technical support after products are installed. The following pre-packaged Hotspots provide long range, plug and play wireless network equipment that has the ability to cover an outdoor area, such as an RV Park, Campground, Marina, or other outdoor venue, with reliable, high speed Internet access. We provide pre-configuration services that allow you to operate the gear "out of the box". Pre-packaged Wireless Hotspot equipment will include all the components you need to broadcast a long range, wireless network. This includes the outdoor access point, antennas, lightning arrestors, coaxial cables, mounting hardware, cat5e cable, and optional routers to control bandwidth limiting. The typical installation will require only a basic technician, or handy man to install the equipment. Because the access point is pre-configured, and the cat5e cables are pre-terminated, installation time can be reduced to within a few hours depending on the type of application. We provide technical support before, during and after the installation. Our technical support department will spend as much time as required to make sure your installation goes smoothly. If you or your installer has questions, they can contact us anytime. Also included is a wiring schematic, and overview diagram that will be included with your order. This will allow you to position the equipment quickly and effectively. All devices will be labeled accordingly for your installation reference. GNS Wireless has many successful installations in campgrounds, Marinas, RV Parks, Sporting events, and other recreational areas. By emailing our support department a overview of your application, our technicians can provide a professional survey to include exactly what equipment you require. Some park owners minimize their cost by just covering a main office or rec hall or general meeting area with WiFi and allowing their guests to bring their laptops to browse the internet. Others try to cover as much of their park as possible. We can provide a solution for either scenerio. Optional hotspot gateways can also be included to allow you to charge guests a prepaid rate that you choose. Additional options include bandwidth control, link advertisement, terms of service agreements, and per customer username and password requirements. Many park owners choose to avoid the added cost of the hotspot gateway and secure the network with a WPA/WPA2 security encyption password, which can be changed at anytime. We are looking for a commercial WiFi installation at our campground. It is approx. 15 heavily wooded acres with hills. There are 75 permanent and another 40 overnight campsites. We are working with a vendor using the Ubiquiti AP's, but have issues with coverage(dead spots) throughout the park and people being dropped off. We have fiber optic Internet service to the campground set at 100 Mbytes/sec. Can you provide a reliable and affordable solution for us? Hi, and thank you for contacting GNS Wireless. Looking at the overview of your campground, I can understand why you may be seeing some signal issues in certain parts of your campground. Due to the large amount of trees in the area, the current access points may or may not be configured, and positioned correctly. Although the Ubiquiti AP's work well, it depends on which wireless extenders you are using, and if you have them configured as a mesh network, range extender or router repeaters, and if so, which wireless n router you are using. The exact wifi booster that you choose will depend on distance from the AP to the location of the end user. I will have one of our technicians email you an updated overview with approximate recommended placement of the wireless range extenders (access points). This will allow you to see how the new coverage will look, prior to purchase and installation. The wifi network should encompass the entire park, and when clients scan for a network using their network adapters, you have the option of broadcasting a single SSID, or having multi-SSID depending on the area. In the meantime, please view some of our pre-packaged wireless hotspot solutions, which include 1000mW, outdoor, weatherproof access points, as well the external antennas. I have a small RV park, and the farthest point is about 100 yards from the main location of my linksys router, which is located on the corner of the property. The existing linksys wireless router, which I believe is a linksys e3000, is slow and often the wireless network doesn't work well with RVs between origin point and reception points. Looking for some type of up grade and would like to use outdoor equipment (wireless N). What do you recommend? Is it in stock? Do I need a computer guy to install the gear? Do I have to replace my linksys e3000 router, or can we utilize it in some other way? Thank you for your help. Hi, and thank you for contacting GNS Wireless. 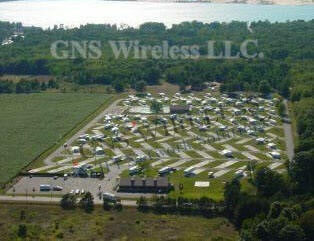 For this type of campground wireless scenerio, I recommend the GNS-1485, which is a pre-packaged wireless hotspot. This package will include everything you need to broadcast a strong, wireless N network signal to your campground. The outdoor access point will act as your wireless booster, and will connect to the included 120 Degree sector antenna, which includes all mounting accessories. The outdoor access point is 802.11N, and operates at 300Mbps. This will be mounted outdoors, on the rooftop of your main office/home, and is completely weatherproof. A single cat5e ethernet cable will connect from the outdoor access point, to an indoor POE injector, which plugs into an AC outlet, then it will connect to your indoor linksys wireless router. Because we will now have a high power outdoor wireless access point, you can keep your indoor linksys router, e3000 for indoor wifi networking. Because you have more then 100 concurrent users on the network at any given time, I suggest installing a cisco wireless router, RV042, which will allow you to set upload and download limits, so that no single user will "hog" all available bandwidth. It also has a faster processor which will create a better internet speed for your customers. This is not a wireless N router so you can plug your linksys e3000 router into one of the LAN ports of the RV042 to keep your indoor wireless network alive, and active. All of our pre-packaged wireless hotspot equipment is in stock, and available to ship same day. We can pre-configure the equipment so it is ready to install "out of the box". This means that no configuration is required on your end. If you have a basic handy man, or if you are able to install the antenna on a pole outdoors, you should NOT need a computer guy to install the wireless hotspot. This setup will greatly increase the range of your wifi network, and extend the range of the wireless N, at least 100 yards. If you need further coverage we can install a mesh network, or add range extenders to repeat the signal from the outdoor wireless access point. The linksys router will strictly be used for indoor wifi coverage. Please let me know if you need anything else, or if we can answer any other questions you may have.